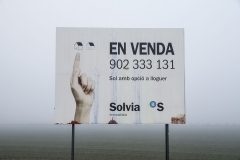 [Re]vealed is a work that deals with the nature of the landscape and the relationship of the climatology with the character of the inhabitants of a specific territory: the fog of the Vic flat. And it does so by playing with one of the main pillars of analog photography: veiled and revealed concepts. The duality between the apparent and the hidden landscape reinforces a vision of reality between ghostly and abstract. 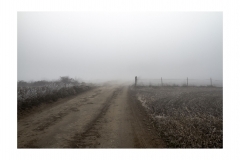 The exhibition in Projekteria [Art Gallery] presents two parts of the trilogy of fog with which Jordi Comas reflects on how progress and the landscape condition the perception we have of the world identity, of postmodernity : Re-vealed and Traces. It idenfies a specific landscape: the flat of Vic, where the climate is of great importance. 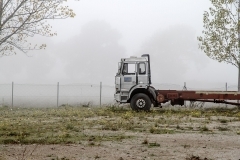 The fog occupies a good part of the winter season giving specific characteristics of humidity that conditions the main economic activity and the character of its people. 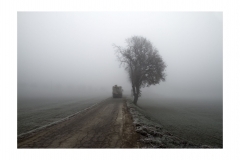 Many days the fog does not disappear, but in others the mist recedes, revealing the gradual process of revealing the landscape, introducing in the work the fortuitous and contingent nature of photography. For a few hours the landscape changes getting different aesthetic strata. 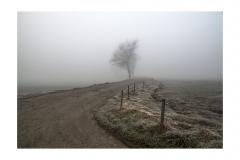 Sometimes the fog offers an almost dreamlike landscape where reality is confused with the dream. 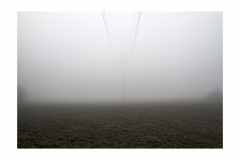 In some of these photographs insinuate veiled objects, high voltage towers, agricultural buildings, roads … elements emerged by surprise when the fog disappears, Re-vealed. In Traces, the fog acts as a natural veil decontextualizing the objects that appear and granting them the category of Objet trouvé. 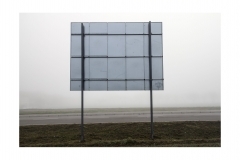 They are always landscapes with traces of human presence, in the form of objects, unfinished housing developments… abandoned elements that tell about the place and its use. The resulting images, distant and cold, respond to a beloved contemplative attitude without shying away from a reflection on the contemporaneity and the landscapes where we live. The photographs reflect the anxiety, the desolation, the solitude, the intimacy and the mystery of the landscape, giving it a physical and psychological weight characteristic of the inhabitants of the place. 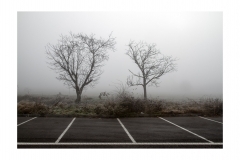 A landscape that only remains exposed when the fog begins to rise, and that, along with the connotations that this entails, radically changes when it disappears. What does appear when the fog disappears?